Fund raiser - I need your help! 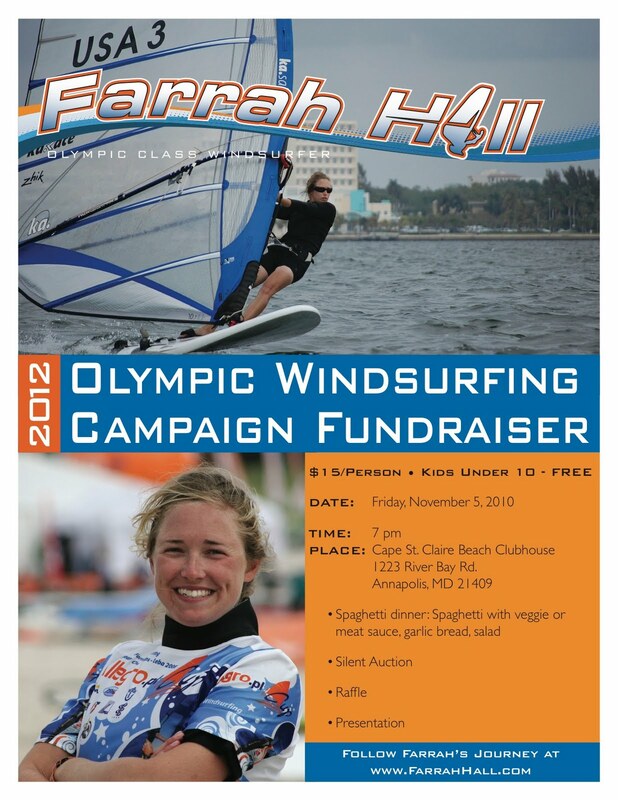 I'm putting together a fund raiser on Friday, November 5 to support my 2012 Olympic campaign. I am trying to make it community-centric, so it will be held in Cape St. Claire, the Annapolis community where I grew up (and still live). 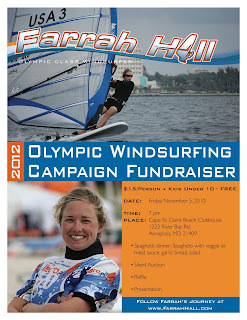 If you're interested in attending and learning more about Olympic and youth windsurfing, read on. The fund raiser will be held at the Cape St. Claire community clubhouse at 1223 River Bay Rd, Annapolis, MD 21409. It will be a spaghetti dinner with a silent auction, raffle, and presentation. We are also going to have lots of cool stuff in the silent auction, with a couple big prizes for the raffle. My presentation will focus on shedding light on Olympic windsurfing, adventures on the campaign trail, and youth windsurfing in the USA. Donations are tax-deductible and go to support campaign expenditures, with a focus on my coaching program to bring it up to par with the fully-funded programs of my international competitors. Good, consistent coaching is critical for success in the highly competitive international arena. Over the weekend, the US Sailing Team was in Colorado Springs at the US Olympic Training Center. It was a little funny to have a training camp where there is nowhere to sail, but the focus was on our physical training programs. The team had a demanding plan for us, and we went through some rigorous testing to determine where we are physically. Chris Herrera, the team's trainer, took all the data and also gave us some workouts. On top of the testing and workouts, our team leader divided us into groups and designed some competitions to facilitate "team building." It was a physically demanding weekend with a really packed schedule. For me, the most important part of the weekend was meeting with Chris to discuss my program. We set a few peak regattas and built a new training program around that. Because it's the end of the season, I am a bit too thin, tired, and my strength isn't at its maximum. For the next few weeks my program will significantly reduce cardio and focus on building strength and adding weight with complete exercises in the gym. Chris and his partner, Lee, also did some presentations for us, which were really motivational. I'm really looking forward to getting back in the gym, and back to the grind, which I love. The best change to the US Sailing Team is its team-based fitness program, managed by Chris Herrera. However, the real program, which has been highly publicized and touted, is still about "the rich getting richer." There is little interest in developmental funding or in classes which currently have low medal potential. Most of team budget that isn't US Olympic Committee money goes towards paying management, logistics, and team dinners and functions. In addition, developmental classes like windsurfing are ignored or left behind. In short, changes to the US Sailing Team program are surface-level only. Although I am part of a new team structure, I still feel very much on the outside. At this camp, I was able to show that I am very fit, work hard, and can form friendships with teammates. However, there is little understanding, and no attempt to understand, what a developmental and completely self-funded sailor like me must go through in order to make a real campaign, let alone a result for the USA. There is little interest in windsurfing, and little interest in me on a personal level, from our team management. Sailors must comply with specific rules and stay in the "team system," even though they receive no support, whether it is financial or simply kindness. As a result, I must rely completely on my own drive, ability to work hard, and self-motivation, which are my only real talents. Without getting great results internationally, it is extremely difficult to feel rewarded for my efforts without the support of team leaders, or being taken seriously by them. The rewards of my own Olympic campaign are the experiences of travel, high-level competition, my work with the Polish team, and the friendships and alliances formed along the way. It is difficult to comply with, or care about, a political, surface-based system that excludes sailors because it is deliberately blind to their value. This is not to say that I don't appreciate what the team's leadership is trying to do with the overall Olympic program. I believe they genuinely want to make the team better, and I want very much to be a part of a team system. However, old attitudes need to be removed and the team built from a development level, from the bottom up rather than the top down. If not, there is little chance for the program to show real success, and it will always be surface-based.